Oh man, what a terrible caption. Give us a real one. Entries will remain open until 11:59 PM, Central Standard Time, Tuesday, May 8. Submit your captions in the comments section, or email at mccracken.ken@gmail.com. 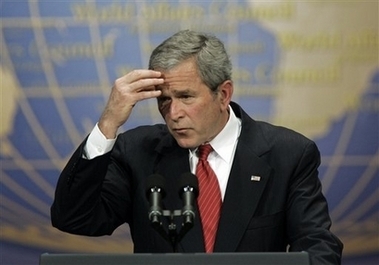 It's rare to see the Bush-o-tron reset in public. Ouch! Y'all didn't tell me I'd have ta do Math! The Great Karnak says the answer is: Blood, Sweat, and Tears. (sound of ripping enveloping) And the question is -- Name the three most unpopular flavors at Baskin-Robbins. Captioning is the answer! Uh, what was the question? Enter today! Gee, Davey, what a big mouth you have! Markos M. Zunigas discusses his disappointment when he discovered the wrong name embroidered on his shorts in his Welterweight bout against his own Ego. Ego won the heavily hyped contest in three rounds. Davey lost the biggest mouth competition to Rosie O'Donnell in the finals by a full three inches. Scientists have finally discovered the source of Ross Perot's "giant sucking sound". "WE STAND ON GUARD, WE STAND ON GUARD FOR THEEEEEEE! Davy could sing every song Celine Dion ever recorded. "Davey, Davey Sock-it! King of the wild frontier . . . "
Just when his big fight was about to start, Davey realized that he was being scanned. Davey thought a lion's roar would intimidate his boxing opponent. Prior to round 1, Davey tests the fit of the new face transplant he got a month ago while vacationing in France. Yikes! I just swallowed my mouth piece! I said "NO HITTING BELOW THE DAVEY"
And now for scenes from next weeks episode of "The Duking Orthodondist !" Moments before firing his campaign manager, Dennis Kucinich tries out his new "Man with balls" persona. Davey had a rare form of turrets syndrome where he would constantly shout "Yo Mama" insults at the biggest dude in the room, so he always had to be ready for a fight. Tagged "The Great White Dope", Davey actually believed that hurting his opponents feelings was the way to a title. When urged to "take the gloves off", Rudy Giuliani insisted he could not act until the Supreme Court said he could. But either way, it was fine with him. 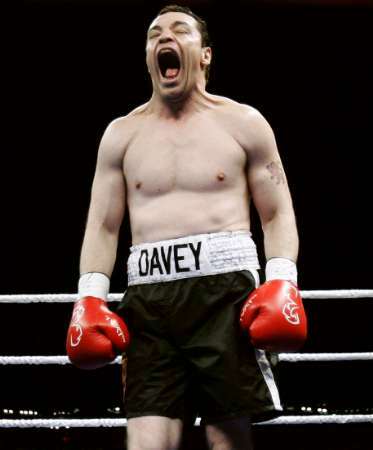 It wasn't so much the quality of Daveys' Mohammad Ali impersonation as much as it was the timing. Davey always got confused. Was it -Mouth open and punch, then, Drop hands and close eyes, or vice versa ? Actually,after one got past the obvious flaws, there were many strong points to Daveys' motivational speech presentation. Ge-o-rge! Which way did dey go, George, which way did dey go? Davey "The Mouth" Hilton demonstrates the first step in his show-stopping technique of putting his fist--boxing glove and all--into his mouth. Forgetting that this was reality and not his favorite video game, Davey was surprised when flames failed to shoot from his gaping maw. Once Davey figured out he couldn't eat Goliath to death, he decided to use a sling.